Cheesecake swirled with chocolate ganache atop a fudge brownie. fudge brownie base [sugar, wheat flour, cocoa (processed with alkali), soybean oil, leavening (sodium acid pyrophosphate, sodium bicarbonate, corn starch, monocalcium phosphate)], cream cheese (pasteurized milk and cream, cheese culture, salt, carob bean gum, guar gum), egg, chocolate chips (sugar, chocolate liquor, cocoa butter, butterfat, vanilla, soy lecithin, salt), butter (cream, salt), sour cream (cultured nonfat milk and cream, cornstarch, whey, guar gum, carrageenan, carob bean gum, enzymes), sugar, egg whites, heavy cream (cream, carrageenan), maltodextrin, soybean oil, cultured lowfat buttermilk (cultured lowfat milk, salt, natural flavor), wheat flour, egg yolk, invert sugar syrup, pure vanilla, lactic acid, salt, stabilizer (gum acacia, propylene glycol alginate, xanthan gum). This is one that a lot of you have been asking for on MyStarbucksIdea.com. And we can see why – a delicious combination of two amazing goodies? Rich cheesecake and a dense, fudgy brownie? We are so there. 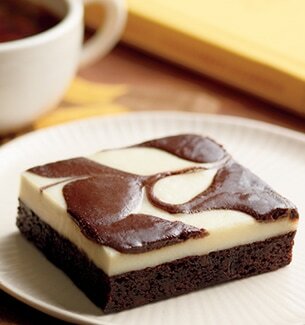 This is a second-generation all-American dessert – both the brownie and modern cheesecake originated in the United States.